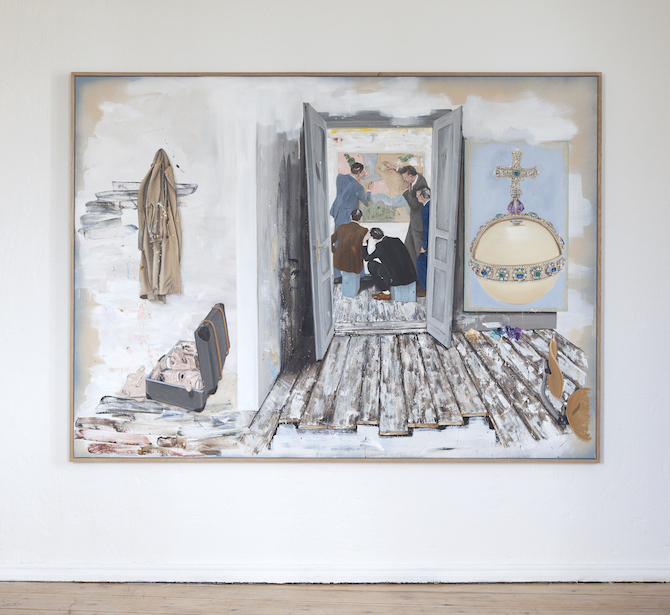 Looking at the work of Danish artist Lars Bjerre, one will not only notice the versatility and beauty of his detailed depictions, but will also come to realise that there is a golden thread that has been running through his paintings and installations over the years: A history of storytelling. 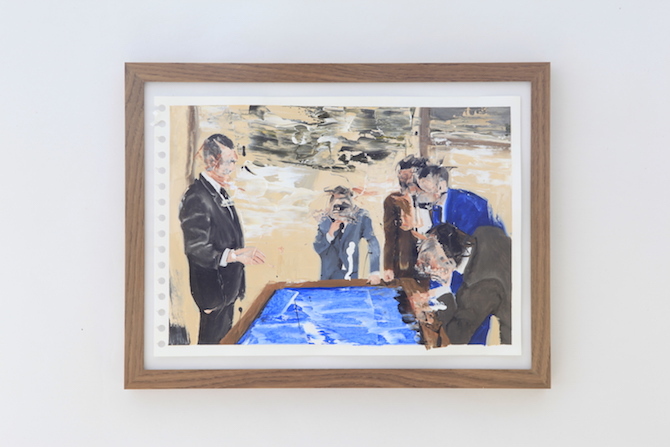 Also his most recent series "The Robbery", which is currently on display in London at the recently opened gallery Hunter/Whitfield, reminds of a cinematic story-board. 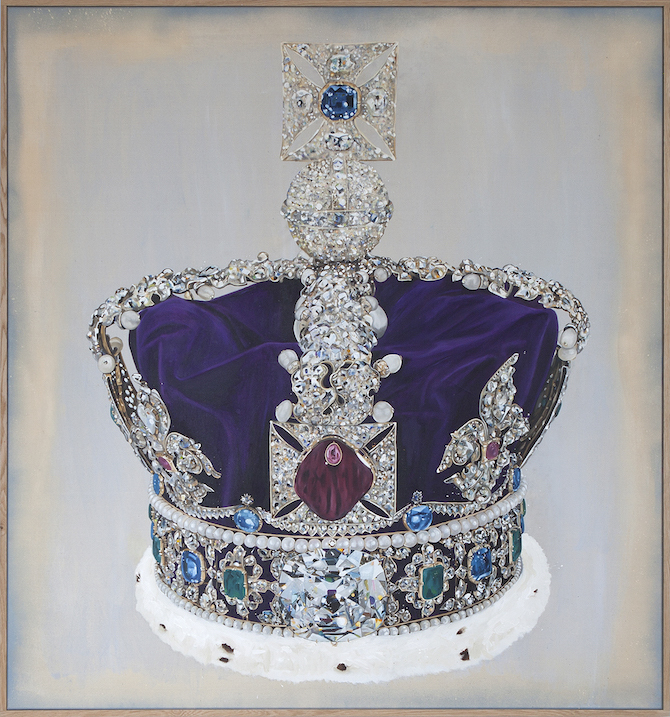 Five large paintings show a selection of fictive planning scenes, a blue print of the Tower and aesthetically flashy details of the loot and its countless diamonds – the British Crown Jewels – evoking a narrative through the images. 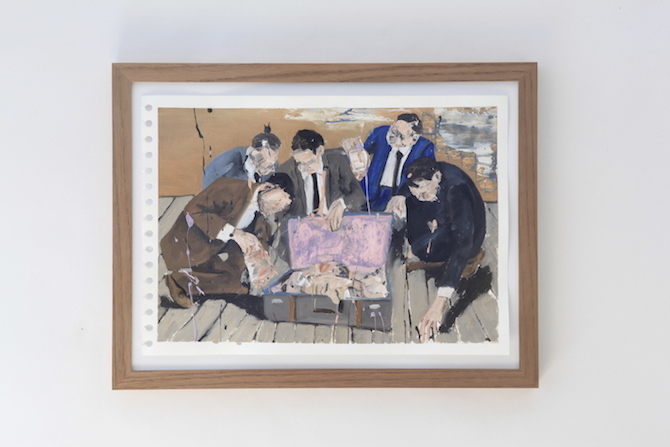 Inspired by crime films and the figure of the anti-heroe, the artist's paintings create scenes, with surfaces between neatly applied and extremely smudged gestures. 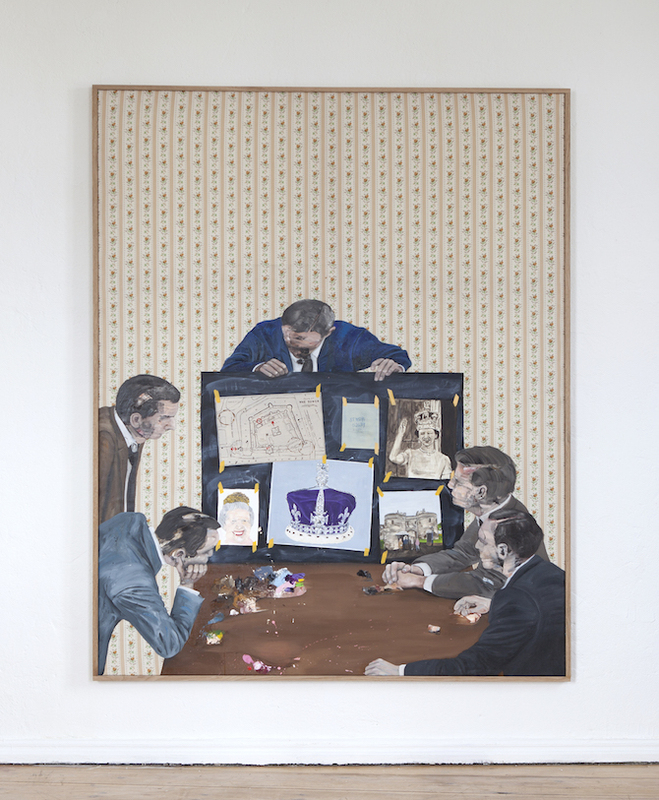 Although Lars changes the themes with each new series that he begins, they always incorporate a mise en scène: motifs, such as hunting trophy pictures ("Hunter's Delight") or brawls inside parliament buildings ("Angry Men") are repeated, manipulated and contrived into the dramaturgy of an act. Stage elements, spatial arrangements and objects turn his exhibitions into theatrical installations. But how important is the plot to the artist himself? What is behind these stories? 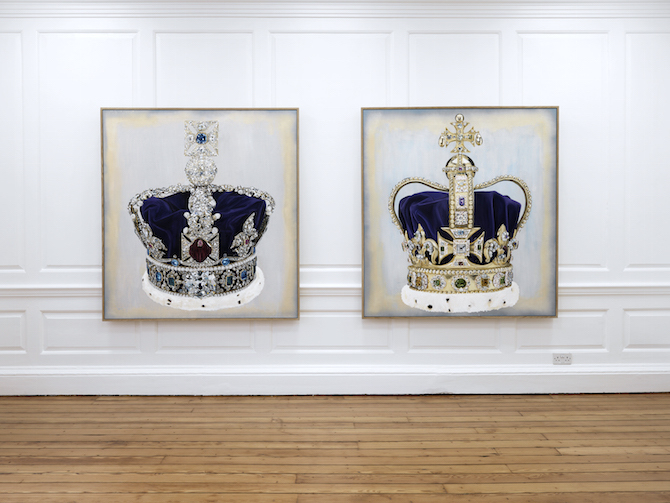 These were some of the questions I asked the Berlin-based artist before his opening in London. 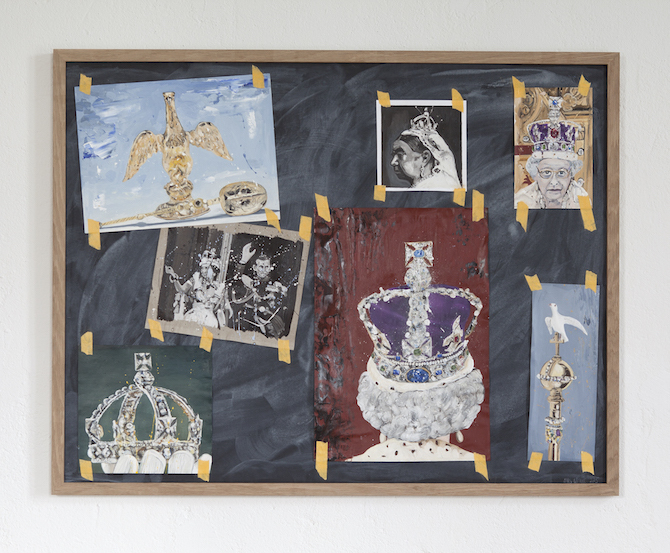 Anneli Botz: Your new series is titled „The Robbery“ and depicts the story of a potential robbery of the British crown jewels - Where does your idea for this series stem from? Lars Bjerre: Although I would never have the courage to actually do it, I have romanticised the idea of making the perfect robbery since I was a kid. I liked the anti-heroes like those in the Danish movies Olsen Banden from the 1970s and 1980s, or other crime films, such as Point Break or Heat. It might be that this is the reason why I see the robbery series as if it was a storyboard for a movie that I could imagine to be filmed. 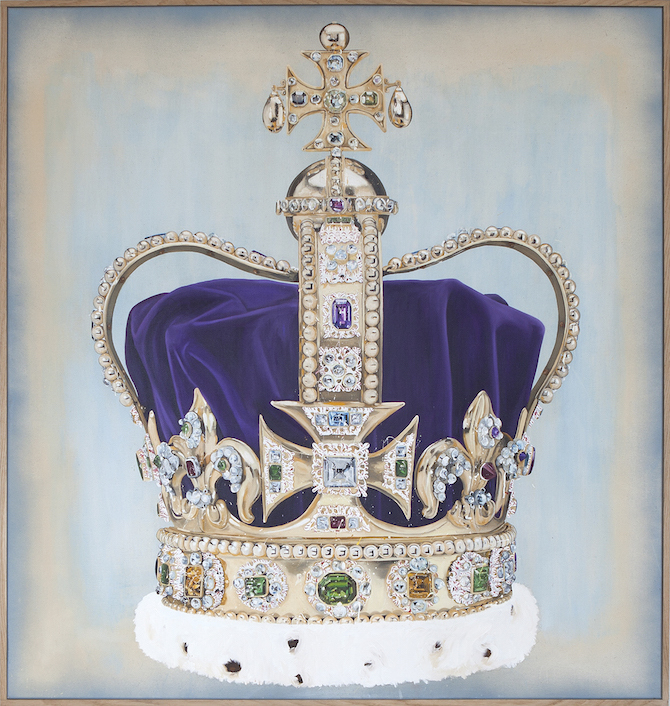 The exhibition takes place at Hunter/Whitfield in London, so I liked the idea of planning a robbery of the crown jewels. Eventually, the planning itself is the most exciting thing about a robbery. Anneli: Does it help to think of a specific scenario, a certain plot while working on a new series? - How much does the narrative aspect mean to your work? 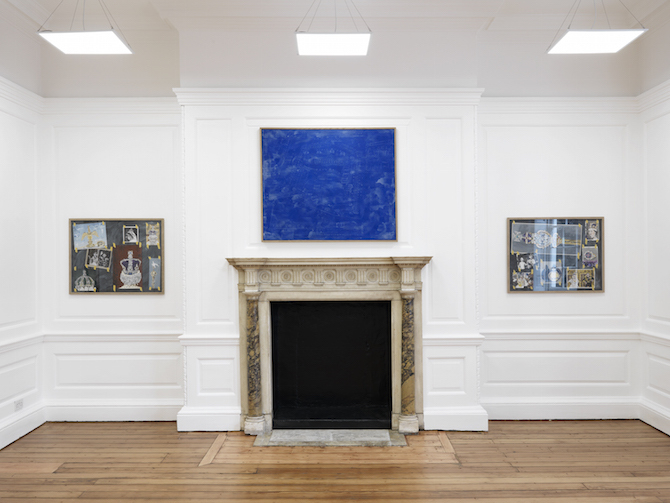 Lars: When I start a new body of works the initial point is almost always built on a new narrative that I want to explore. Fortunately, I have so many narratives piled up that I don’t even have enough time to tell them all. When one story is told, or finished in a sense, I wrap it up and begin with a new one. I prefer to work in theme-based series where each one gives me the opportunity to dig into a specific theme, researching new questions that interest me. I like working with material that can express these concerns. It feels most free by working that way. When I start a new series, I always feel like a racehorse on the track, ready to get out of the booth. Anneli: Your work has been mainly figurative in the past years, yet topics and figures seem to have become more distinct; your style is even more realistic. How would you describe that development? Lars: I think it depends what I try to achieve in the respective series that I’m working on, and what I’m aiming for. In my view I got more and more loose in my brushstrokes throughout the last years compared. And in that sense also more free in my working process, like the freedom of using any material that I wish to include. Anneli: You pay a lot of attention to detail. How much of a perfectionist are you? Lars: I am somehow a perfectionist, but mostly in the last part of the process up to an exhibition. The first ¾ of the working process I feel more like a mess, my studio is a playground and everything can happen. The narrative I’m working on can be stretched to different lengths. Anneli: You started your career as a fine artist rather late after working in the psychiatric field for years. I wonder how much impact this had on your work as an artist. Is it an interest in the multiple layers of a mind that can also be translated on the canvas? Lars: The psyche and emotions have and always will be interesting for me, when I work with different themes. The multiple layers of the mind, that you are referring to, also relate to the layers of meaning that I hope that to find in my own work. 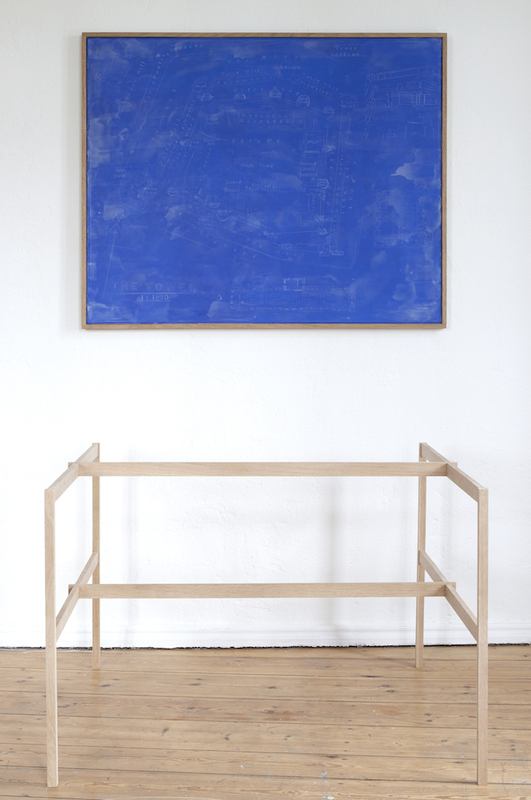 Anneli: How much of a necessity has painting become and what kind of feeling does it give you? Lars: My favourite place is my studio and I want to spend as much time as possible in that space. 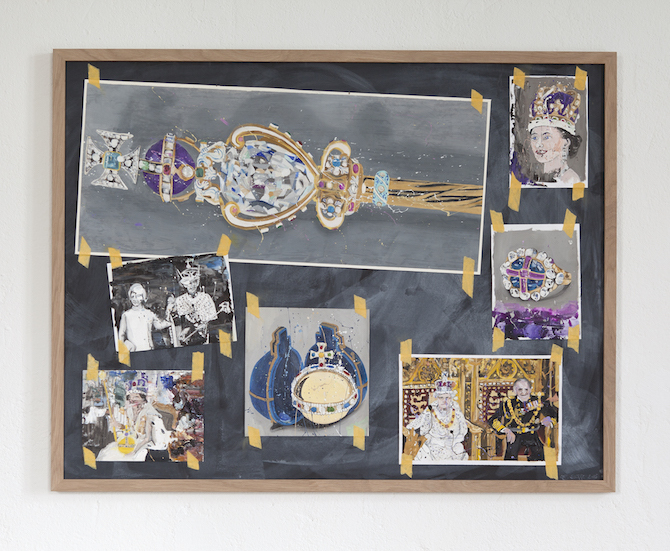 Anneli: The idea of masks, disguising the individual, seems to play a big role in your work. In your earlier years for example men in suits were wearing pig heads, at other occasions they were masked as a bear or cow. How would you describe the role of the mask in your work? Lars: Most people are wearing some kind of mask everyday, for example as a protection. This feature used to appear in my work, but rather like a reversed metaphor, in which the masks exposed something else. I also really like the materiality of rubber masks. That is, perhaps, the main reason why I work with them. I had an old pig mask lying next to my studio's window, where it was exposed to sunlight. When rubber is exposed to too much direct sunlight, it gets hard and then falls apart. A similar process happened when I made the ceramics piece of a Nixon mask for my current show out of soft clay, then dried and then burned it in an oven so that it turned hard. A mask, to me, is interesting as an aesthetic item. Anneli: In the present "The Robbery" series the masking is taken to another level because the disguise also works on an actual utility level. How does the mask function in the current series compared to before? Lars: The idea to work with masks again for the robbery series was partly inspired by the disguise masks that appear in many of my favourite crime and robbery movies. One of them is Point Break, in which the four protagonists cover their faces with the masks of four American presidents. They are seeking freedom through the money they steal. Patrick Swayze, for example, wears a mask with the face of Ronald Reagan. The bad guys faces' are always more fun than those of the good guys. 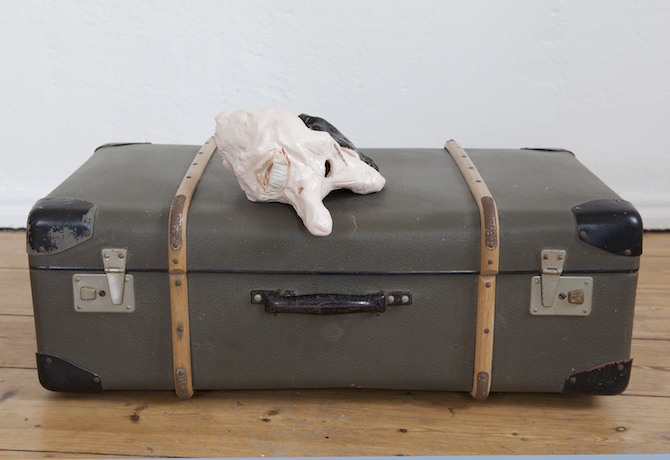 Anneli: Is the disguise of identity, or maybe even the loss of identity something you aim for in your work? Anneli: You live in Berlin, but you have also spent residencies in Copenhagen and London and work with galleries in both cities. Do some art pieces work better here than there and the other way around? Lars: If I had made ”The Robbery” as a show in Berlin, the heist would have been a different one; it would have different implications and meanings. 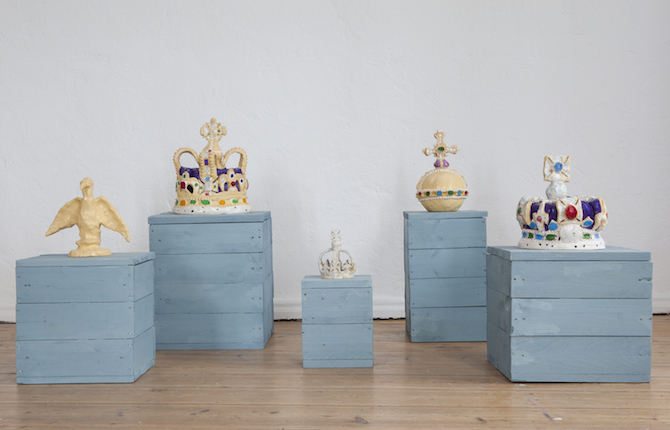 In Denmark, which is also a monarchy, I could have made a show about the robbery of the Danish Crown Jewels. In that sense, the place does affect the narratives that I work on and the questions I want to pose. "I escaped when the trees started to grow"